Weatherproof and very hard wearing, the price includes designing your banner (if required) and printing on our large format digital printer, so you can choose to have whatever colours or design you like. Your bespoke banner will then be finished with a strengthening hem all round and metal eyelets for fixing. Some suggested sizes are shown, but the banner can be any size you like. Don’t forget, as with all our products, design and printing is all part of the service. One of our designers will contact you as soon as you place the order to discuss the look and content of your new banner. Weatherproof and very hard wearing, the price includes designing your banner (if required) and printing on our large format digital printer, so you can choose to have whatever colours or design you like. 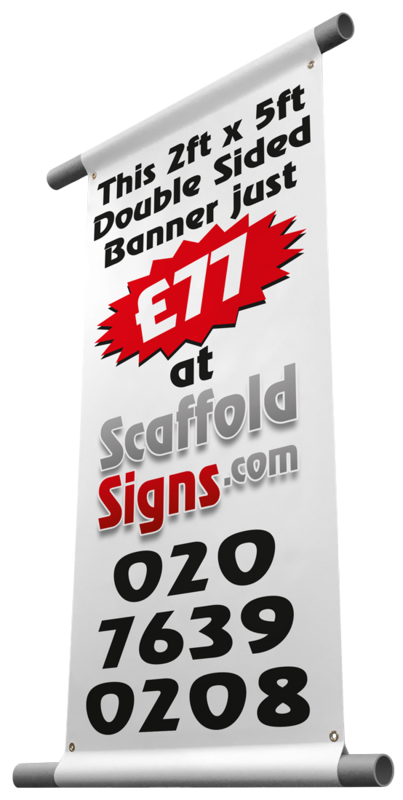 Your bespoke banner will then be finished with pockets top and bottom suitable for inserting scaffold poles, and metal eyelets for securing..